Even the old dogs can teach a thing or two to the pups. No, I am not talking about sled dogs here. I am talking about the mushers. 71 year old Jim Lanier just won the GCI Dorothy Page Halfway Award for being the first musher to run into the checkpoint of Cripple. Lanier, running in his 15th Iditarod shows no signs of slowing down. Never have scratched in his last 14 Iditarod attempts, Lanier has entered and finished the race in each of the last five decades the race has been in existence. His goal is to finish this year in competitive fashion and after that; “who knows” he says. Lanier arrived to Cripple at 1:35 pm Alaska time with 13 dogs. Cripple signifies the halfway point of this year’s Iditarod, the 40th running of the Last Great Race on Earth. The GCI Dorothy Page Halfway Award is a trophy and $3,000 in placer gold nuggets courtesy of Iditarod Principle Partner, GCI. The award will be presented again to Jim Lanier in Nome on Sunday, March 18th during the Iditarod Awards Banquet at the Nome Recreation Center. Way to go Jim! 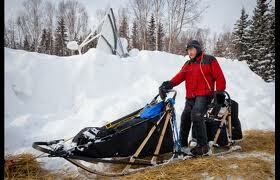 Show those young musher’s how it’s done! “and $3,000 in place gold nuggets” should be “placer gold nuggets”.